An example to show control over various plotting features. Import the necessary modules for plotting. SkyCoord module provides flexible celestial coordinate representation and a draw_limb method draws an edge as seen against the dark sky background. Date of the image taken can also be displayed in the plot. 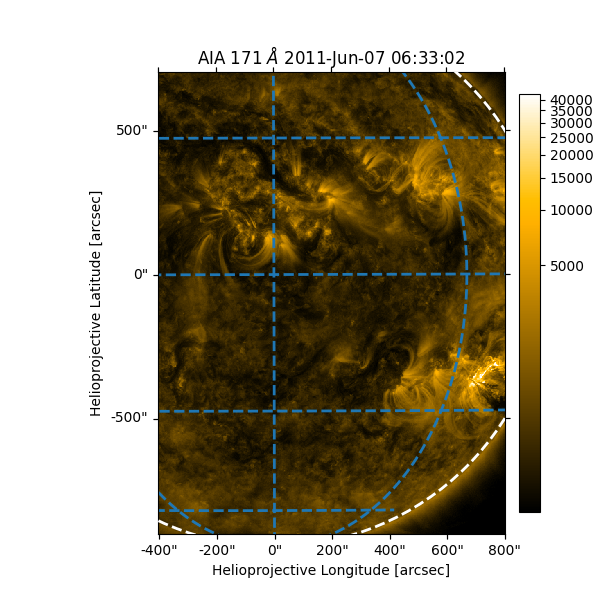 The SunPy map peek method shows a helioprojective grid by default. This is sometimes not desired, and instead a heliographic Stonyhurst grid might be required. Although maps offer a simple way to include a Stonyhurst grid, often times we want more control over the Stonyhurst type. The example below illustrates some aspects of how a map plot can be altered as desired. For more information regarding the axis and grid settings, go to Ticks, tick labels and grid lines in astropy. # Use integer coordinates for either axis.